Ever since Ezra Klein left his perch as the editor of the Washington Post‘s Wonkblog to strike out on his own, media insiders have been wondering what exactly he would build as part of Vox Media, the fast-growing parent company of The Verge and SB Nation. 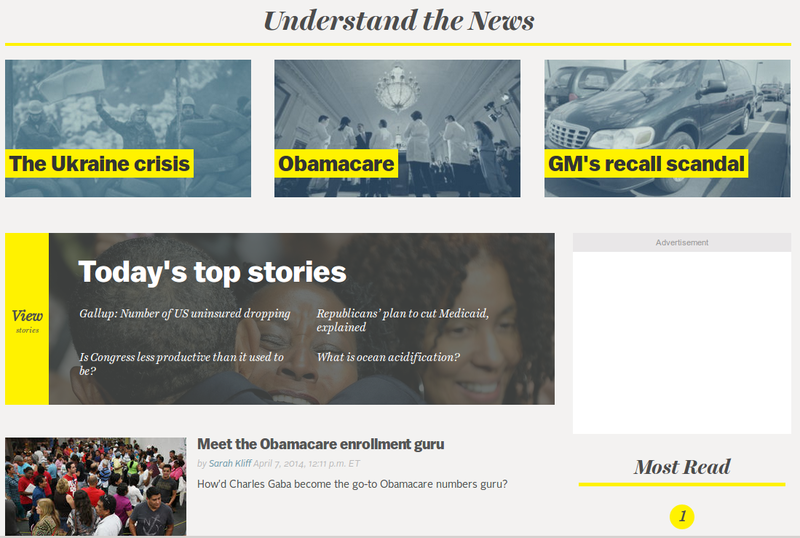 After a couple of teasers, the world got its first look at the new site — now known simply as Vox — when it opened to the public on Sunday night. While there is much to like about the new effort, it also faces some significant challenges, both as a journalistic endeavor and as a business. Building new things is never easy — especially in the media industry, which often likes to devour or shoot down anything even remotely new or different. Just look at Nate Silver’s FiveThirtyEight venture at ESPN, which like Klein’s project is an outgrowth of Silver’s successful blog at the New York Times: although it has fans, the predominant response to the launch was criticism that it didn’t go deep enough, didn’t live up to the hype, etc. While there has been somewhat less hype about Klein’s venture, there is still a lot riding on it, if only because the former Post blogger has been repeatedly referred to as a “wunderkind” and reportedly asked for a fairly impressive package from his former newspaper before leaving for Vox Media. And while he may not have done as much trash-talking of traditional journalism as Silver, Klein has made references like the one in a recent NYT interview, in which he said he was “held back by the culture of journalism” at the Post. — A clear purpose and a clean design: From my initial reading of the site, including most of its backgrounders and overviews, Vox provides more or less what Klein said he was trying to build when he described it as a “news site/encyclopedia.” It is clean-looking and well-designed, with very little to distract the eye — especially when compared with some other sites that have multiple advertising and promotional boxes, banners and interstitial widgets. The design definitely fits with the explanatory “slow journalism” approach Vox wants to take, which is good. — The “card” metaphor makes sense: The most notable difference from a regular news site is the use of what Vox calls “cards,” or short digests of information about a topic, which it links to using special yellow highlighting. In a way, these are similar to the internally-generated “topic pages” that traditional media outlets such as the New York Times often link to, although the Vox version tends to be shorter and somewhat more topical, like this one. — Well-optimized for mobile use: One good thing about the “card” approach (which other digital-content companies of various kinds have also adopted, including Twitter) is that it works well on a mobile device, and Vox has taken advantage of this by making its cards easily swipe-able with one finger. In fact, the whole site is well designed for mobile, since it is what designers call “responsive,” in that it automatically adjusts to fit any screen size. — Making it into a business: Vox is part of the larger Vox Media empire, which is fairly well funded, but presumably it still has to make a business case for what it does. And there are other well-funded companies focused on the same intersection of information and journalism, including FiveThirtyEight. Vox plans to focus on high-end customized advertising, and advertisers may want to be attached to its intellectually rigorous approach, but that still has to be proven. — Competing with Wikipedia: Many people mention FiveThirtyEight or even traditional media outlets like the New York Times, but for me one of the biggest and most dangerous competitors for what Vox wants to do is Wikipedia. It has vast scale, thanks to its all-volunteer approach (Vox actually has to pay its writers and editors a salary), and it also has an important friend in Google, which is going to be a distinct challenge for Vox if it focuses on search-driven traffic rather than socially-driven traffic, as some believe it will. — Making it personal: In many ways, Vox is swimming against the tide in digital media, which has been making journalism much more personal than it used to be, with First Look Media being a prominent example. For a site whose name means “voice,” the Vox approach seems to be relatively voice-less and impersonal, although there are flashes of humor (try entering the famous Konami code on the site for an example). That may suit Vox’s explanatory approach, but it could also make it harder to build an engaged audience. As someone who thinks that the rush of real-time journalism often leaves valuable context and background out of the equation, I have a soft spot for the kind of explanatory journalism that Ezra Klein wants to do with Vox and I wish them well. But there is a difference between serving a consumer need or a journalistic need and filling a business or market need, and scaling up to even a fraction of Wikipedia’s capabilities is going to be an expensive proposition. Great use of the Circa paradigm, just wish they’d get credit for it! My biggest problem with Vox is the suggestion that it is Wikipedia for news. Wikipedia allows anyone (with Internet access) to contribute, with the exception of certain topics that are protected (and for good reason). A community of people work to make Wikipedia accurate (or as accurate as possible in the modern Internet). For the most part, it is free of political slants and agendas. For example, if one were to read the Wikipedia article on the 2012 Benghazi attack,(http://en.wikipedia.org/wiki/2012_Benghazi_attack) it is factual, objective and informative. If you read the same coverage on Vox, it is far from objective and cherry picks the facts. It is simply Klein’s spin on the story with his agenda. BTW, I chose this (Benghazi) topic because it is prominently displayed on the front page and also has a topic in Wikipedia. I would prefer to refer to Vox as another Huffington Post or Breitbart news source and not in the same category of Wikipedia. I do read Vox, but I am not so naive as to believe that I am getting the truth – Vox is simply a perspective of events. I’m going to say that I like this approach to news. While Grayzip says that he/she does not like to be talked down to, there are many people who would like a synopsis of the topic that is generally missing from news stories, save for a one line summary, maybe, of the topic of the story. Let’s remember that Cards are not traditional stories – they are a set of summarized posts that work together in a wiki type of way. Sure, we have Wikipedia, but there are times where the reader may not want the generic wikipedia view of a topic and wants an editorial analysis from a journalistic source, which is missing from the fact-based Wikipedia entries (or, should be as far as encyclopedias go). This site bridges the gap between the true wiki and an editorial positioned wiki that aims to disrupt the traffic to wikipedia. Maybe there is more in depth reporting in a card than a wiki might provide. Wikipedia is not for reporting – it’s an encyclopedia that is not supposed to take a position one way or the other. On a design note, usability is a problem. They must have tested with a left-handed user, because having the table of content for cars on the left forces all right hand users (which are the majority) to cross over the content and click on the left hand links, which is counterintuitive. Maybe they didn’t want a right hand column, because they feared it would look too much like a traditional blog, I dunno. What I do know is that every time I have move my cursor to the left from the right side, where it generally lives, because I’m right handed – I get frustrated with the user experience. 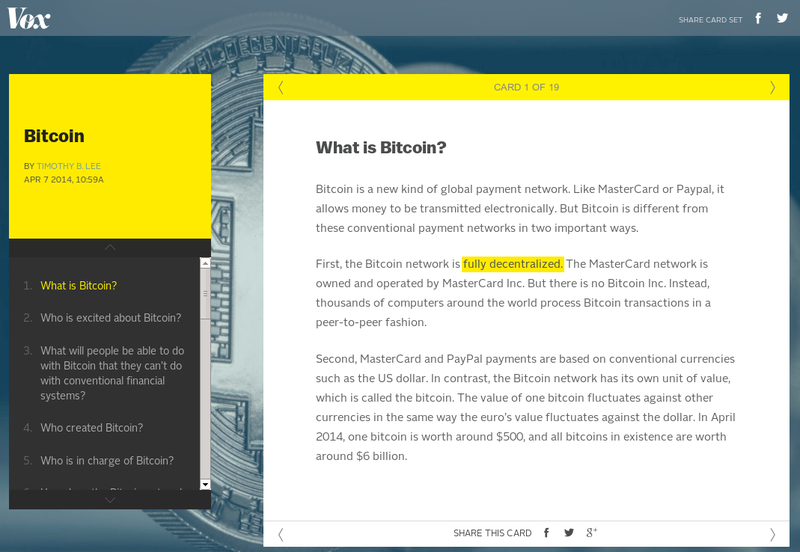 The screen grab above embodies my problem with the site’s concept: I *know* what Bitcoin is. I couldn’t tell you exactly when I *learned* what it was; as with most everything in the news, I — like most close followers of the news — formed a working understanding of Bitcoin by reading a thousand stories and tweets and blog posts about it as Bitcoin emerged. I can tell you there was never a time when I thought to myself, “I’d really like a site to walk me through Bitcoin as though I’d just emerged from a coma, and frankly Ezra Klein seeming to think I need one feels kinda insulting. Maybe my mom would be grateful for such a site, but she can’t be Klein’s dream demo and anyway she already has Wikipedia. If Klein is smart he’ll realize it and pivot. You guys know what a pivot is, right?